For a sweet, indulgent treat any time of day, warm up with this decadent chocolate oatmeal! Warm up with this decadent gluten-free chocolate oatmeal. Heat water to almost boiling and set aside. Melt coconut oil, syrup, and chocolate in a medium saucepan. 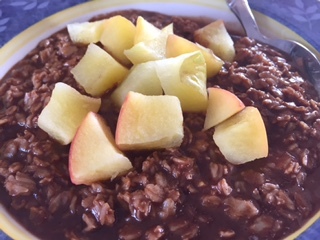 Reduce heat, add oatmeal and cinnamon, and stir. When it starts to bubble, continue to stir oatmeal until it absorbs all the oil/syrup mixture. Cover for approximately 5 minutes and let sit until desired consistency.